DNS Analytics offers unparalleled visibility into your domains and query usage. Find out where queries are coming from, watch them hit your nameservers in real time, and troubleshoot network issues like never before. All DNS hosting providers have access to the query logs for their clients’ domains. However, only recently has the technology become available to leverage this data to provide valuable insight into domain activity. We hosted a live demo for a few of these use cases in a recent webinar, which you can watch below. Please note, the demo uses the DNS Made Easy version of the DNS Analytics application. However, all the functionality is the same. You can use DNS Analytics to pinpoint a CDN (Content Delivery Network) that is making too many requests. You can filter query logs by Source IP and contact the CDN provider that is making excess requests. This is typically the result of a misconfiguration during setup. Troubleshoot overages and excess queries by filtering your query logs by Source IP and Record Type. Usually happens when you turn up a new system and a configuration error will cause the system to make too many requests. Filter results by Location, Record Type, and Source IP to pinpoint the source of a DNS-level attack. You can also compare your results over different time periods by downloading query logs and comparing them in two separate browser windows. Historical data can be reuploaded to DNS Analytics (learn how) so you can detect traffic abnormalities. Log into DNS Analytics by using your Constellix login credentials. 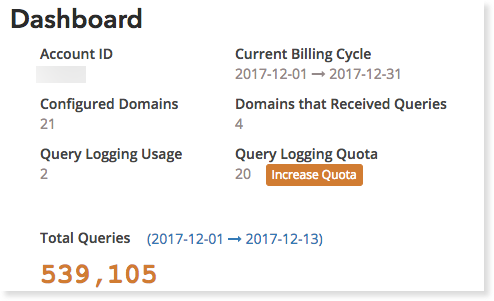 View your monthly query log quota and current usage. Query logs can be downloaded on a per domain basis and are one-minute logs of all incoming queries. Additional logs can be purchased for $0.27 each from this screen by clicking the “Increase Quota” button. Query counts by day for all domains in the account. Use the table to quickly spot deviations in traffic. This is also where you can click on a domain name to access more in-depth analytics for that domain. You can select domains by clicking the checkbox next to them for comparison in a stacked bar chart below the table. The table displays any query logs that were requested recently. 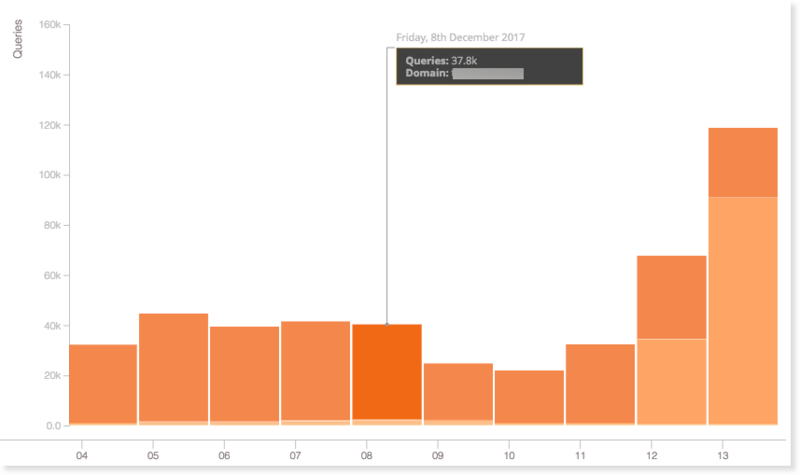 Time series displays the number of queries over the selected date range. 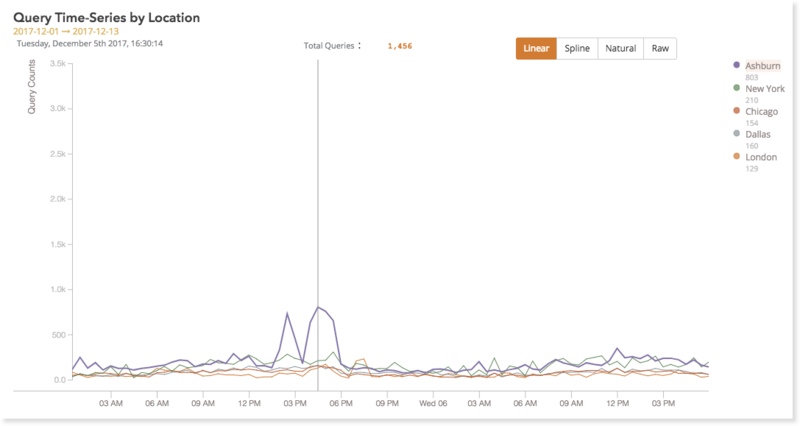 Hover over the graph to see total queries at each 30-minute interval and min/max by location. Queries are shown as circles that have been sized relative to the query counts at each location. Hover to see min/max/mean which is calculated based on the total query counts taken every thirty minutes. View query logs for your domain from one of the sixteen points of presence in our network by clicking the play icon in the “Logging” column. 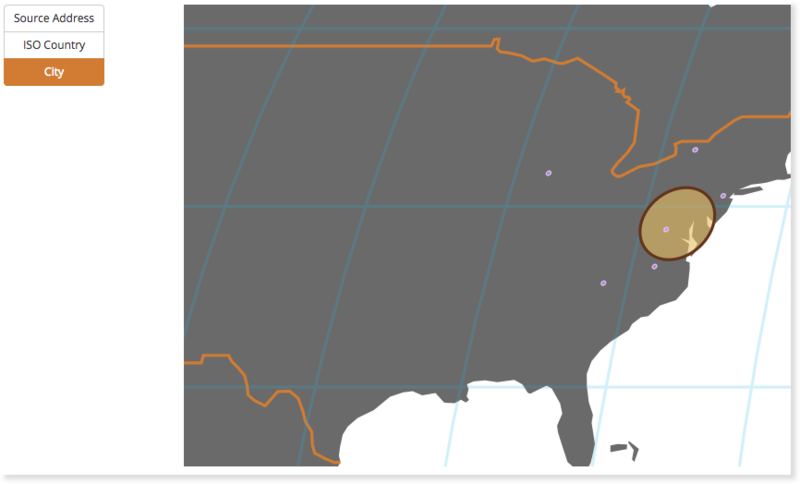 Select which locations you want to view in the time series below. Compare selected locations in a line graph. Click the name of a location in the legend to remove it from the time series. Hover to see total queries for all locations at each 30-minute interval. Click the button to start logging queries. 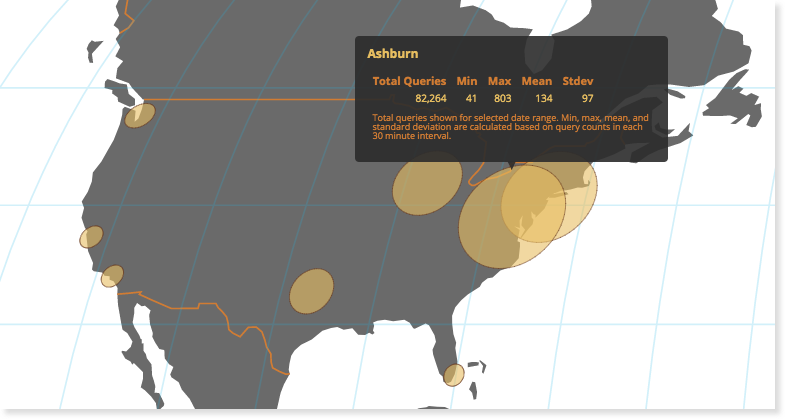 Watch incoming queries in real time using the three different views: Raw, Top, or Map buttons. The current query log can be downloaded as a CSV file by clicking the button. Downloaded query logs can later be reuploaded and viewed by clicking the button. View a text file that logs each query, timestamp and associated information in real time. See query counts for each item (eg: for City, each row is a city name) and displays the fraction of the total query count. Queries are displayed as yellow circles that are sized relative to query counts at each location. The purple dots (by default) show the source address of incoming queries. You can change this setting by choosing “ISO Country” or “City” in the dropdown menu to the left of the map.